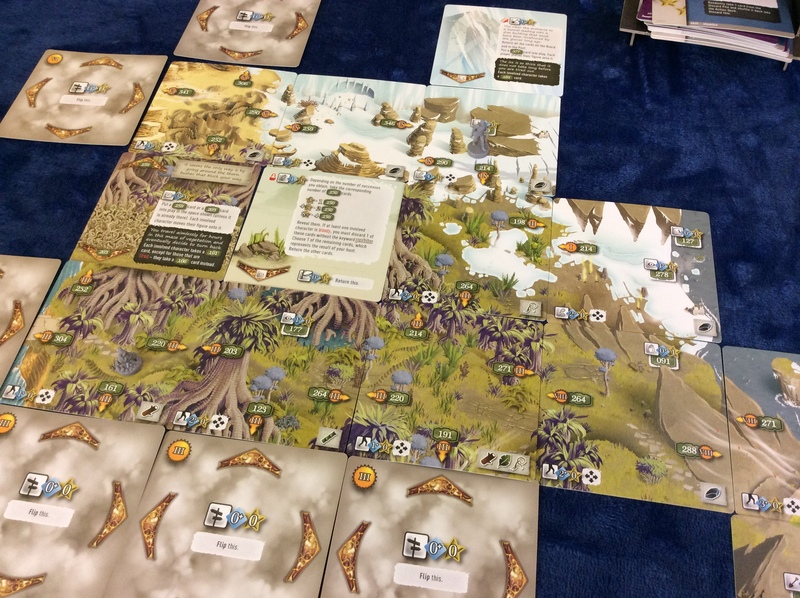 This review features visual and textual depictions of core game mechanics, topography, flora, fauna, sites of archaeological interest, death-traps, ethnographic and botanical discoveries, sheet music, and supernatural agencies from The 7th Continent, including elements of the Path of Repentance and Icy Maze expansions. I’m not sorry. At the age of 30, Mary went off alone exploring Africa in order to complete her late father’s work. Through contact with the local tribes, some of which were cannibalistic, she learned jungle survival, canoeing, and discovered new species of fish. Upon returning to her native England, she received an offer to join an expedition to a new, mysterious continent. She decided to postpone writing her memories, as the lure of adventure always comes first! 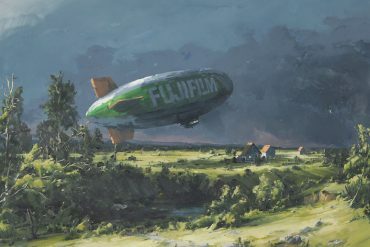 With only one clue to go on—a vague mention in the expedition journal of a native “with remarkable powers who lives far away to the north,” Mary boarded a freighter bound for Australia. Disembarking in a well-provisioned dinghy when the freighter pulled close to the lost continent’s coast, Mary was lulled asleep by the waves and awoke to find her craft “grounded on the sand with its hull gashed and water pouring in.” The seventh continent has reclaimed her. Nothing quite compares to experiencing a great story completely cold. 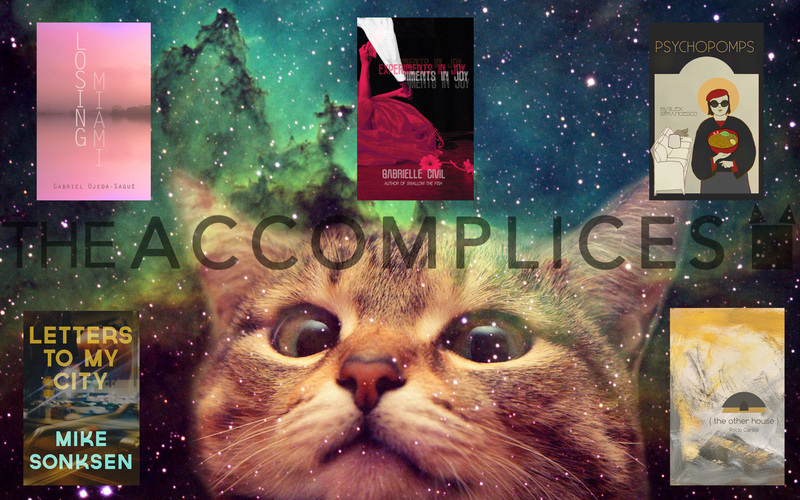 No review, no trailer, no synopsis; nothing but the assurance that your time will not be wasted. Opportunities come rarely enough for it to feel like a little indulgence, especially if, like me, you’re normally careful about where you invest your money and time. Mary looks around her. Something red is half-buried in the sand, and animal tracks lead north into a dense forest. A few seagulls glide above the choppy waves, and a turtle has pulled itself up onto the beach. A strange, pineapple-like fruit grows from the sparse grass north of the beach. Mary begins by investigating the beach for anything valuable that may have washed ashore. She’s in luck: The object she spotted earlier is a wooden chest, and it appears to be intact. 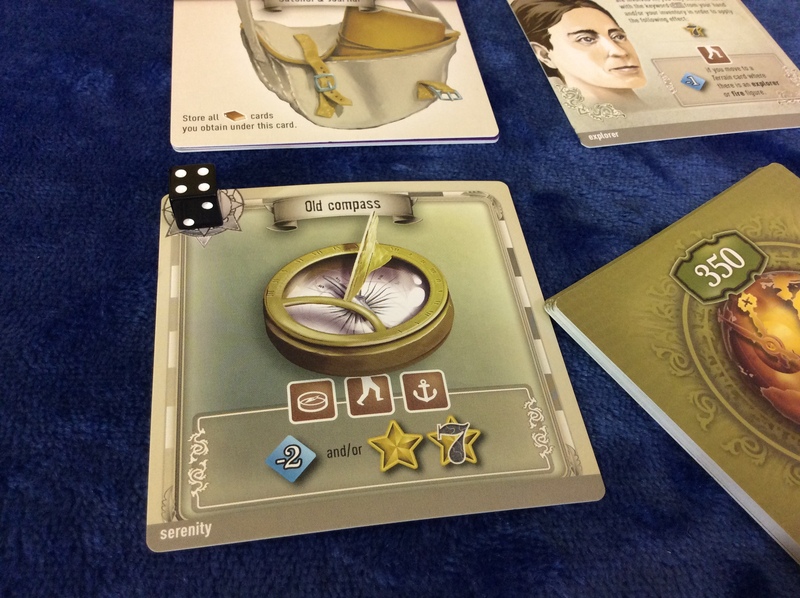 Unearthing the crate and springing the lock, Mary discovers an old compass within. It could just as easily have been a pistol, a treasure map, a tin of pills, or any of a dozen other minor treasures, but what Mary found is an old compass. She’ll take it. Next, Mary takes a moment to examine the notes from the previous expedition. She learns about the vampolina, a strong, flexible, flowering plant with a texture similar to the liana vine. I’ll have to keep an eye out for that, she thinks. I cut my teeth on point-and-click adventure games. I played the classics, like Myst, Riven, The 7th Guest, and Maniac Mansion, as well as lesser-known titles: Discworld, Obsidian, Gobliiins, Shivers, and Starship Titanic, to name a few that stand out in memory. As hardware advanced, true point-and-click adventures fell by the wayside, and if they exist now at all, it’s as watered-down “hidden object” games marketed to the lowest common denominator or small, graphically simple “escape rooms” designed by dedicated hobbyists. 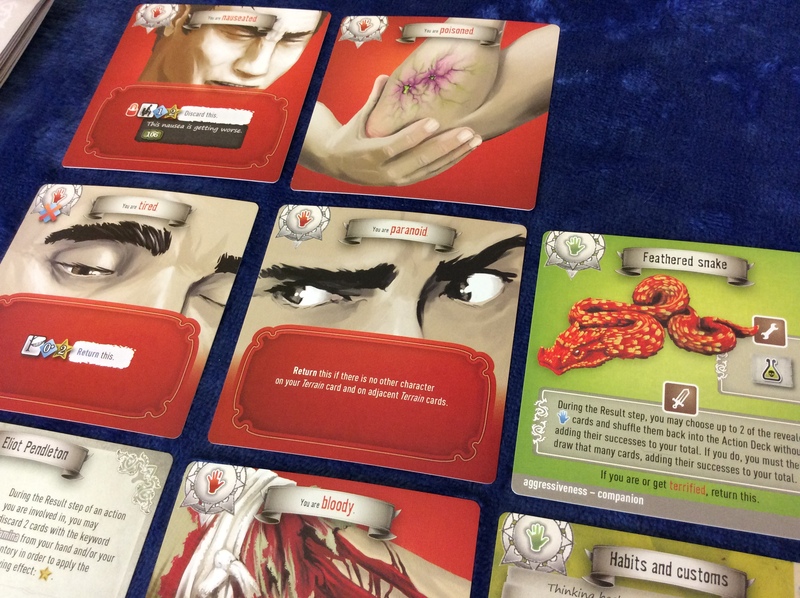 Apparently, a lot of board game designers played the same games I did, because we’re starting to see a point-and-click revival in board game form. 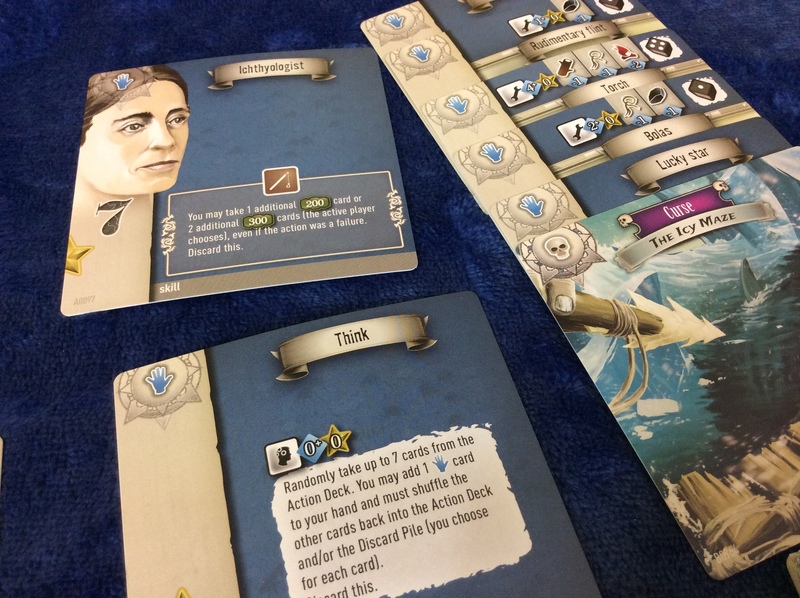 In 2015, T.I.M.E Stories introduced the “decksploration” concept, selling self-contained adventures in carefully constructed decks of cards. 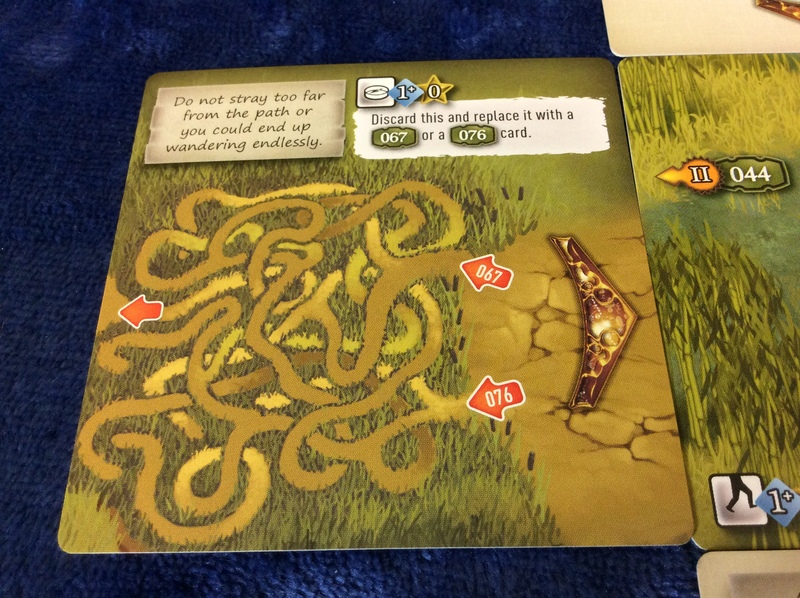 There’s a lot of flexibility in the T.I.M.E Stories format, but the core gameplay focus is on route optimization: players are expected to run through the deck several times, learning which choices lead to vital clues and which to dead ends, until they can complete the adventure within a given number of turns. 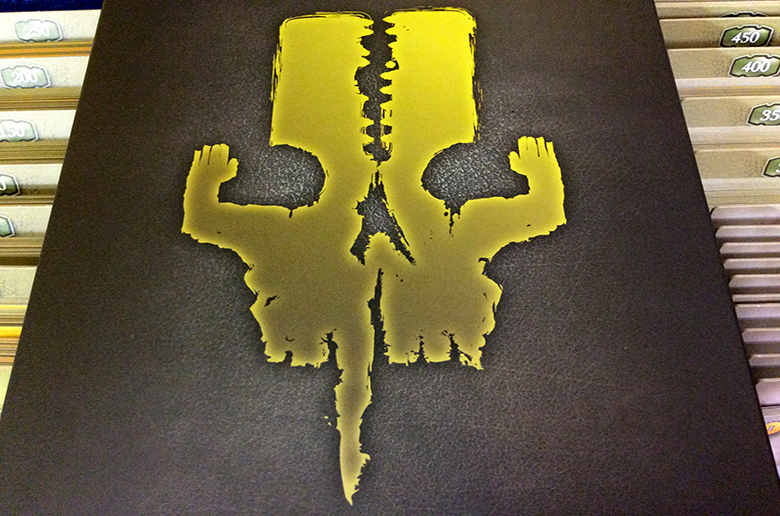 The 7th Continent goes in the opposite direction, bringing a sweeping vision of an entire lost continent to discover. 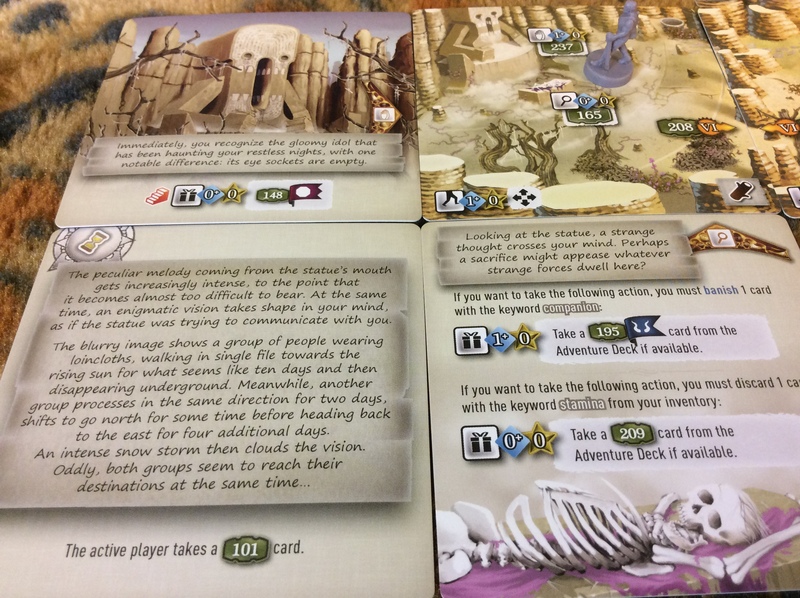 Rather than short, trial-and-error sessions, The 7th Continent wants the play experience to feel epic, and a single play through the game is intended to take 10-15 hours to complete (broken up over several play sessions, of course). 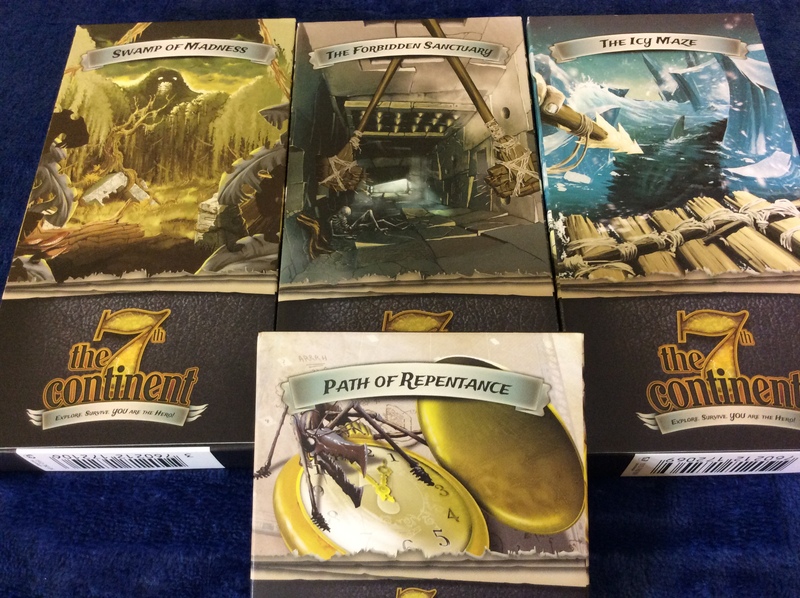 The expansions for The 7th Continent come in both large and small varieties. The 7th Continent takes place in the aftermath of a doomed expedition to explore a mysterious new continent off the coast of Antarctica. The players, embodying explorers who took part in the expedition, have been stricken by an evil curse—one of four included in the base game, with at least five more spread across the game’s expansions—and have returned to the continent in search of clues that might lead to lifting the curse. But the evil is insidious, and the continent itself is far from hospitable; if the party succumbs to exhaustion, hunger, injury, or madness before they have solved the curse’s mystery, the adventure is over. Lifting each curse will require all your wits and endurance. Next, Mary scouts the forest to the north of the beach. Miraculously, she discovers another journal page, caught in a tree’s branches, covering the migratory cycle of processionary caterpillars. Continuing north, into the forest’s edge, Mary follows the animal tracks east, but swarming leaf insects block her path. The path north is blocked by a wall of thorns, while a swarm of bees surround a tree to the west. Mary decides to handle the bees first—they may be hiding honey, if she is sneaky enough to retrieve it. …that will surely come in handy later when her stamina begins to deplete. The difficulty of avoiding spoilers is not, perhaps, surprising in a culture that regards experiences as products to be packaged, marketed and consumed. I can only imagine the frustration of screenwriters who spend fifteen pages on a perfectly constructed cold open or an elaborate misdirection, only to have their efforts nullified by even the most basic elements of the movie’s advertising. At the same time, I find the concept of “spoilers” fundamentally silly. Even the word itself, as though all of a story’s pleasure were contained in its conclusion, a bubble of nectar on the lip of a flower, foreknowledge of which could spoil the whole process. As though the other 89 minutes or 249 pages count for nothing. It’s of a piece with the equally ludicrous claims that something like the Ghostbusters remake or the final episode of LOST somehow invalidates the prior work. Immediately after watching The Sixth Sense for the first time, I rewound to the beginning and watched it again, and my enjoyment actually increased as I saw all the carefully arranged pieces that led up to its inevitable conclusion. While shopping online for The Murder of Roger Ackroyd, I blundered into a review that spoiled its ingenious twist, but that didn’t stop me from appreciating the dozen little mysteries of the supporting cast or the meticulousness with which Christie allowed her murderer to deflect guilt while remaining fundamentally honest. A well-told story can never be truly spoiled, and the preciousness of spoiler culture—the culture of spoiler sensitivity—can whip me up to a neck-ringing, Homer Simpson rage. 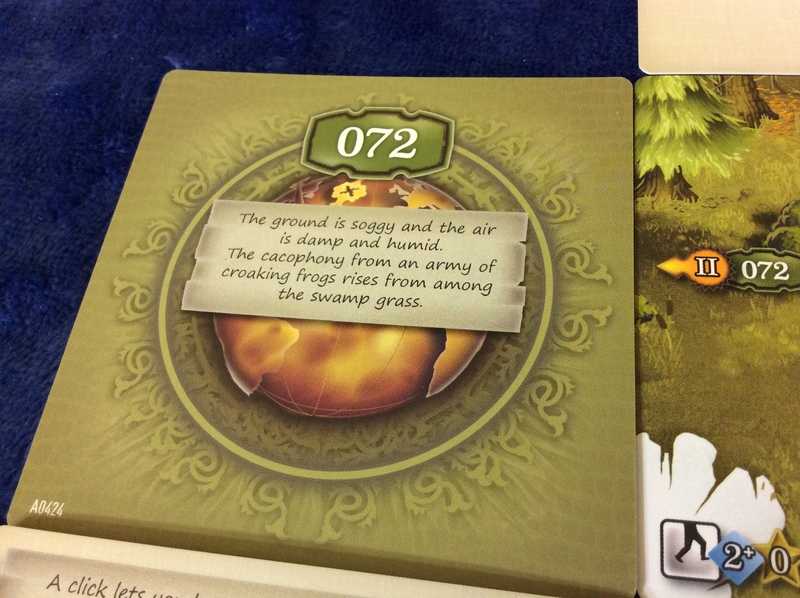 Beyond the bee-tree, Mary finds a swampy area. But what’s this? There appears to be a path hidden among the rushes. Not wanting to disturb the leaf insects and having no way past the thorn wall at present, Mary heads west to investigate. Further west, along the hidden path, someone has set up several hidden snares, and a brush fire rages to the north. With her keen eye, Mary disables the traps, but the path beyond the rushes twists and meanders. Moving the lever in one direction will cause the plates to move away from each other and release your foot. Moving it in the opposite direction will only make the situation worse. Can you determine which is which? 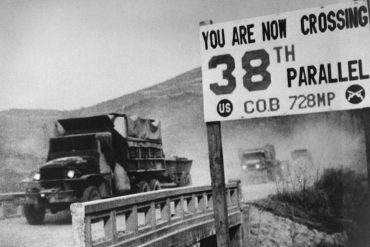 Some of the puzzles could have been lifted directly from the pages of Highlights Magazine—there’s even an obnoxious spot-the-difference puzzle you might encounter if you lose the trail—but many of them are more logic-based affairs. 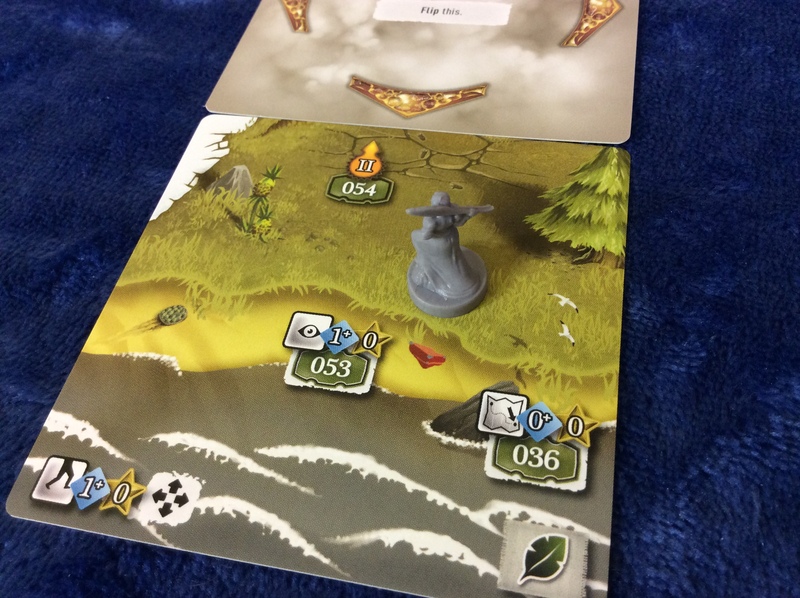 There are also classic inventory puzzles, cleverly realized in The 7th Continent’s card-based design by the inclusion of little colored banners on some cards. Most actions will direct you to draw a card of a certain number—say, 453. If the reference has a colored banner on it, though, and you have an item in your inventory with the matching banner, you can add the value in that card’s banner—say, +7—and draw that card instead—in this case, card 450. An early puzzle in the area of the game known to fans as “Tutorial Island” amounts to a mini-scavenger hunt and shows off this mechanic well as the explorers attempt to repair the device that will transport them to the mainland. You’ll also have to keep a close eye on your surroundings if you hope to survive the dangers of the continent. Fans of point-and-click adventures will remember the infamous “pixel hunt,” a time-honored ritual of systematically sweeping every square millimeter of the screen in search of clickable hotspots. 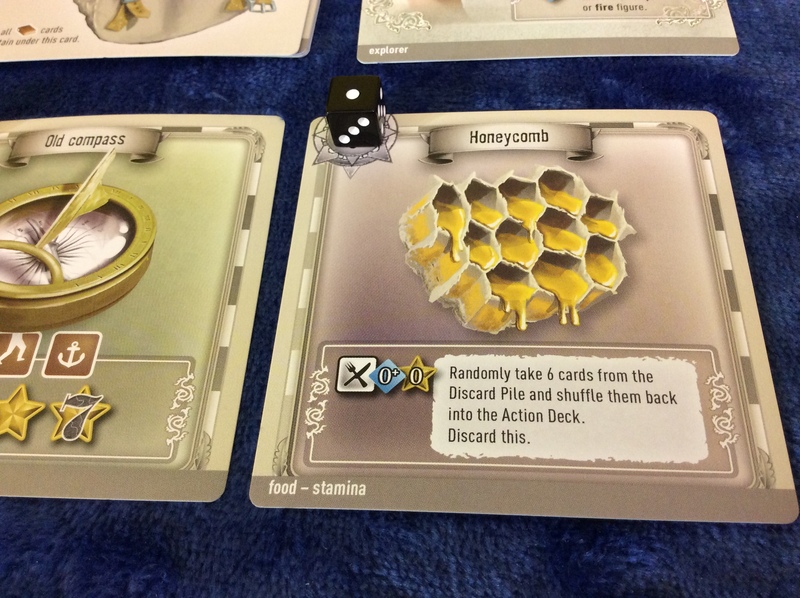 The 7th Continent avoids such nonsense, but there are subtle details on the cards, requiring a sharp eye (or a magnifying glass). 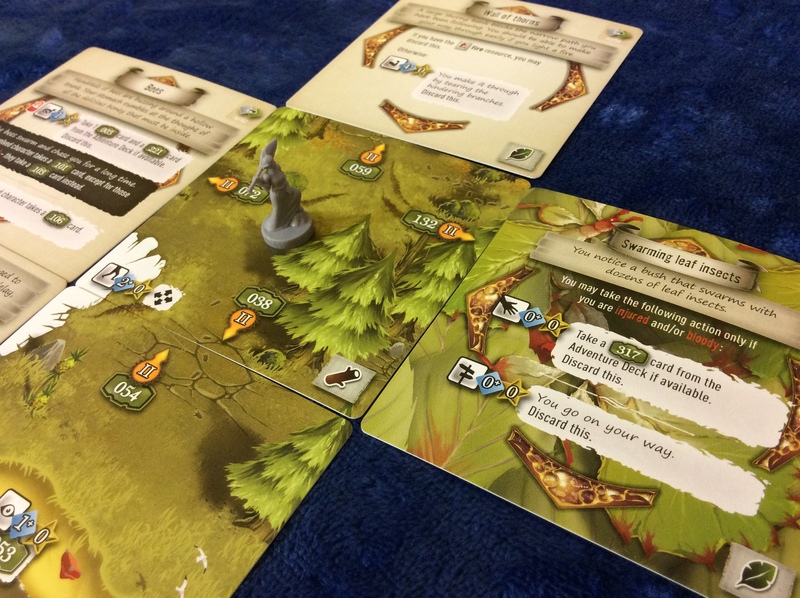 Animal tracks might indicate the presence of game nearby, while native flora can take on new significance if you possess the right page from the previous expedition’s journal. 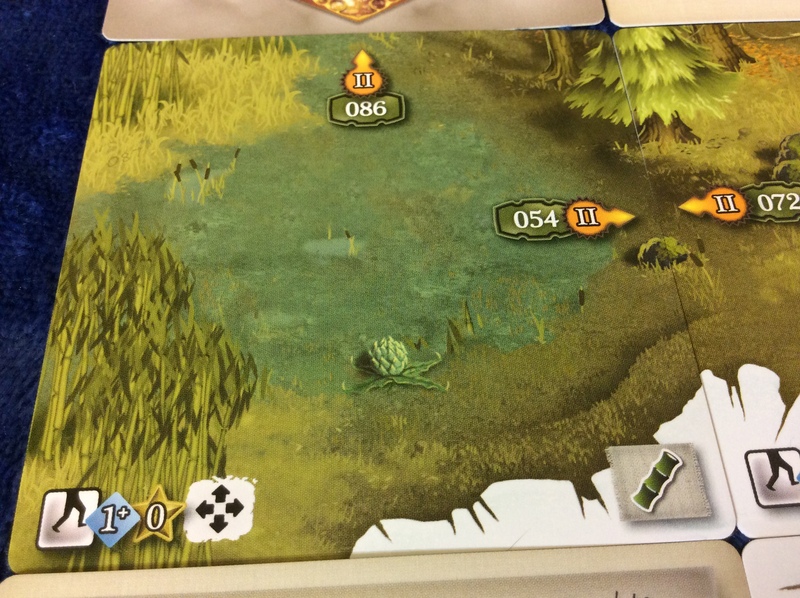 There are even hidden numbers that allow you to replace your terrain card with a new one, unveiling a hidden path or shortcut. 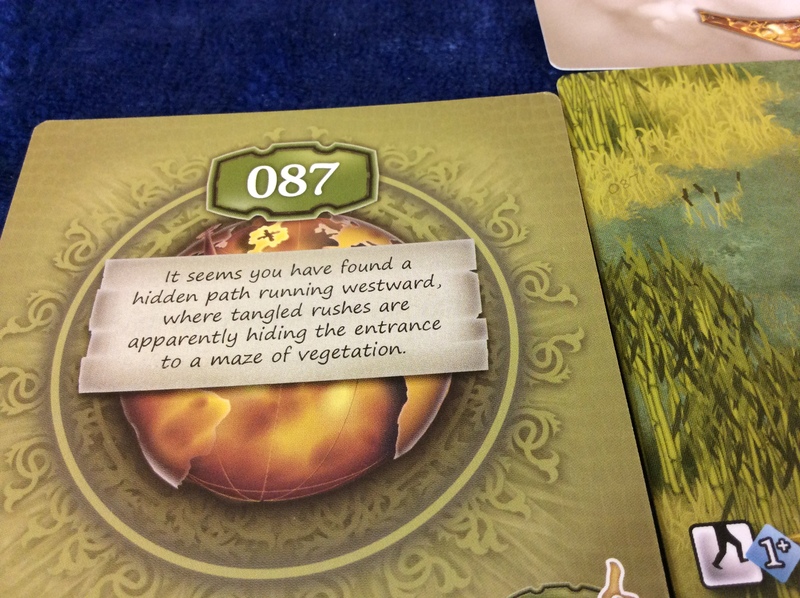 There’s a hidden number on this terrain card. Can you spot it? Mary easily picks out the correct path, but before moving onward, she returns to the beach, where tall grasses grow, and weaves a basket to hold her provisions. She also fashions a camouflage outfit from the greenery and, as she passes through the forest, breaks off a branch to use as a walking stick. She’s now feeling a little better equipped. Clearing out the brush-fire, she finds nothing to the north but a continuance of swampland. Her curiosity can be allayed no longer; Mary explores to the west, beyond the twisty little maze of passages, uncovering a mist-laden pond alive with buzzing insects surrounding a decrepit dock. Crouching down, she catches sight of a telltale ripple in the pond’s surface. Although she is not hungry now, Mary knows she will need provisions for the long journey ahead. First, she tries to think of anything that might improve her chances of catching something worthwhile. Of course she can think of something; she’s an ichthyologist! Studying the pond carefully, Mary takes her pick of several large, golden-scaled fish, avoiding a red-and-black striped water snake. She snatches one of the golden fish from the water, securing a nice haul of nutritious, piscine meat, which she stashes in her woven basket. 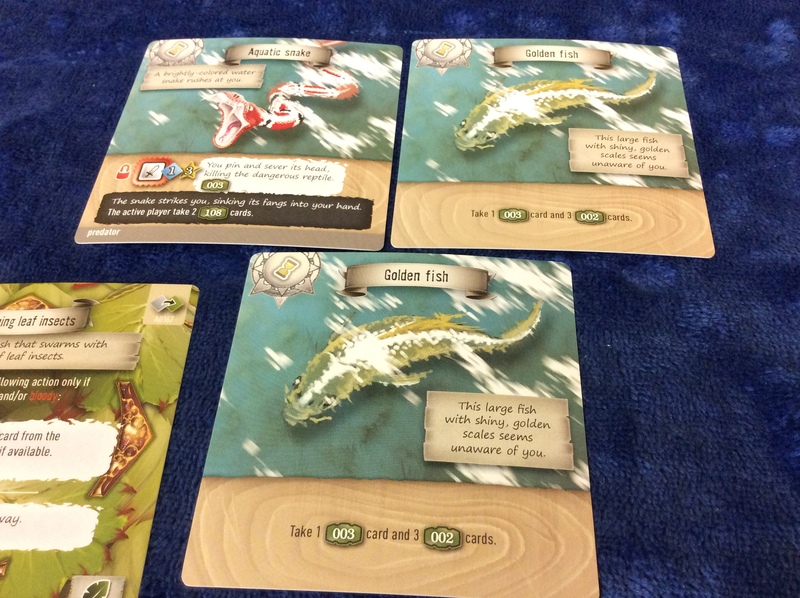 The activity seems to scare off the other fish, however; Mary knows her next attempt might not be so lucky. 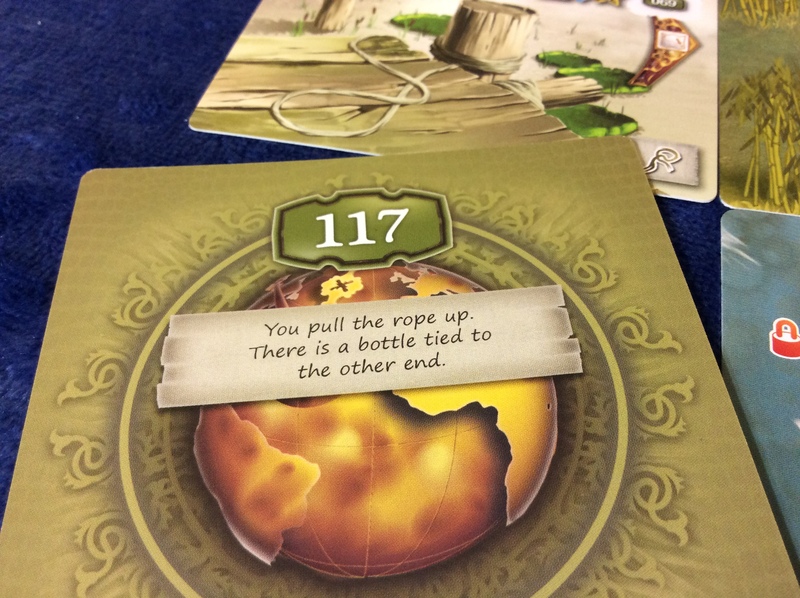 Now, this kind of spoiler sickness has infected the board game world. If you’ve only been exposed to a certain kind of game—the kind of game that’s played in one-off sessions, whether it’s Monopoly, Smash-Up, or The Settlers of Catan—the notion of board game spoilers will sound borderline psychotic. 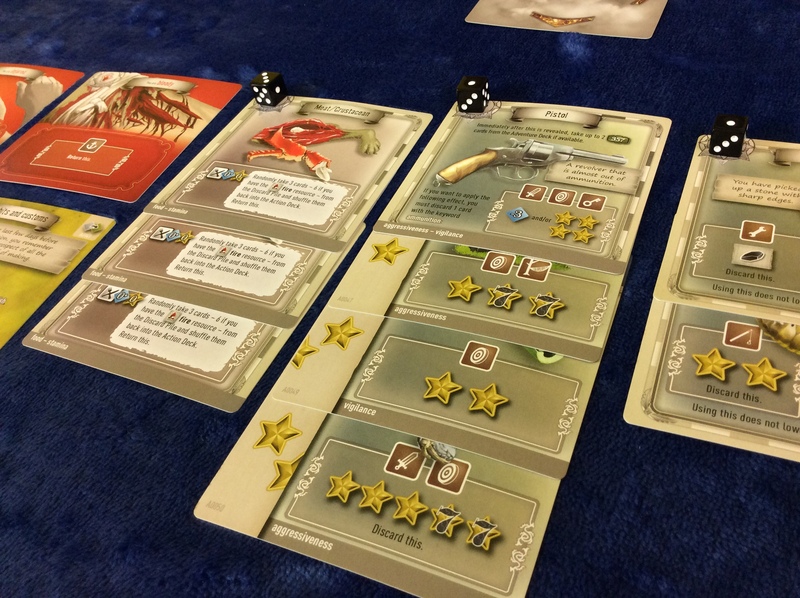 Yet several recent trends in game design encourage players to wall themselves off in spoiler quarantines. 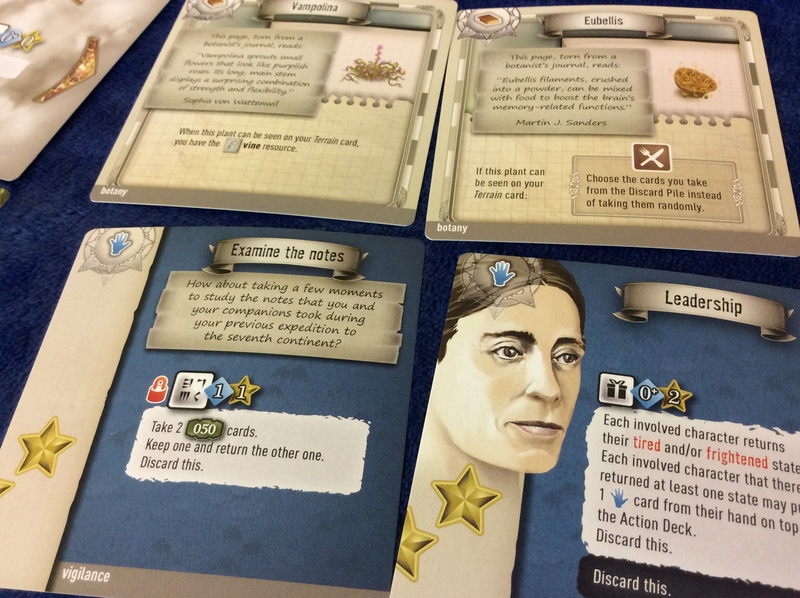 The “Legacy” framework, popularized by games like RISK Legacy and Pandemic Legacy, partitions some of its components behind advent calendar-esque doors, sealed envelopes, and mystery boxes, building an atmosphere of secrecy that undermines frank discussion of the game. 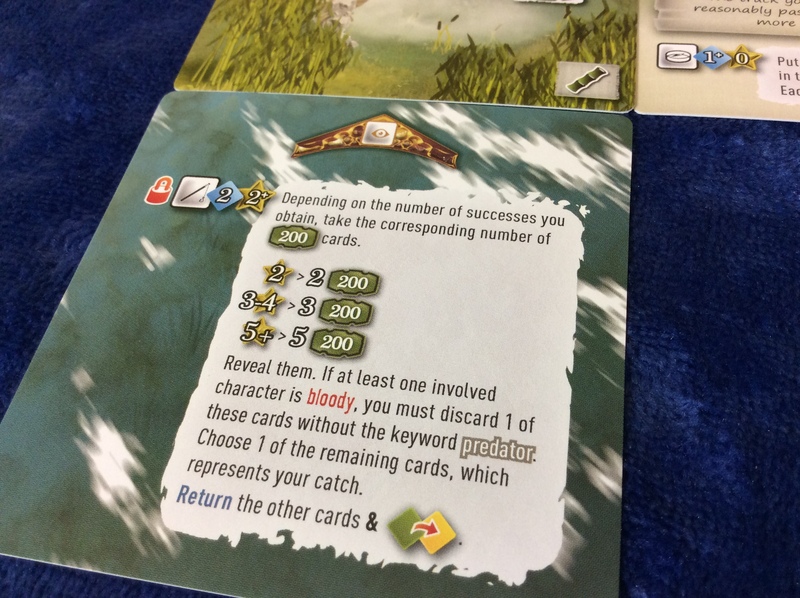 Isaac Childres, designer of the quasi-Legacy game Gloomhaven, actually issued an official decree on spoilers, encouraging players to address cards and scenarios only by their reference numbers. This hard-line stance masks spoilers but also, in my opinion, shuts down conversation and community, obfuscating things to a degree that players can only publicly discuss the game if they have the box open in front of them—and coming as it does from the foremost official on the game, it invests the spoiler gestapo with actual authority to match their sense of self-importance. There’s something borderline underhanded about these tactics. 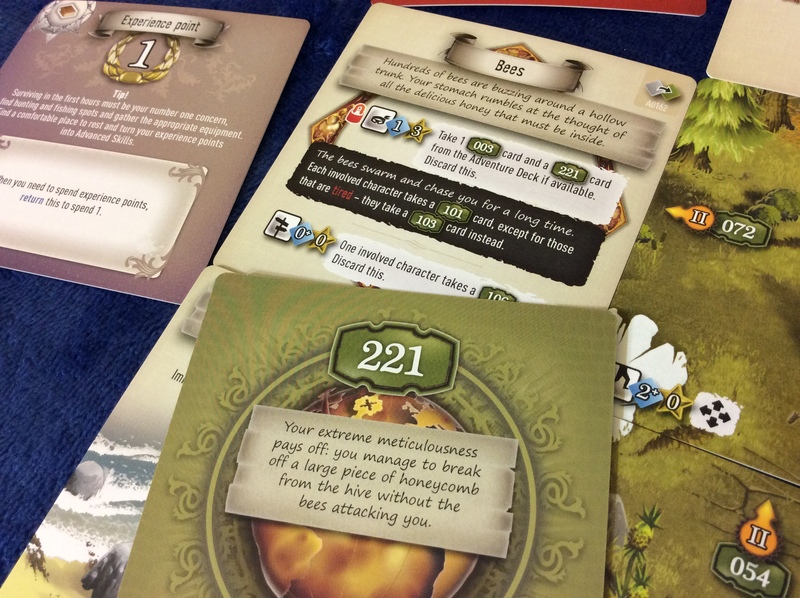 While the mystery and surprise of Legacy games give them an aura of ritual, making them transcend “game” to the lofty realm of “event” or “experience,” they also make it nearly impossible to tell the good from the bad. 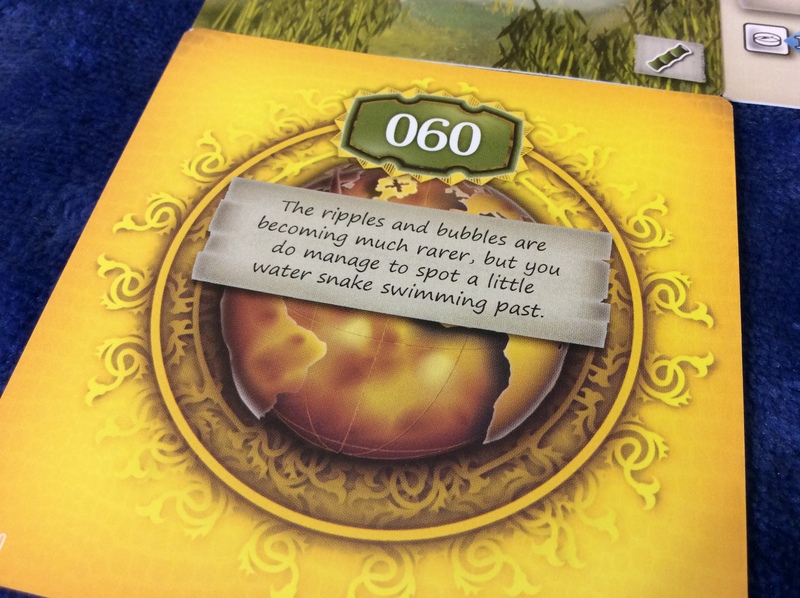 So far, there have been very few bad, but as the format gains traction, we’ll see more Seafalls and fewer Gloomhavens, and we’ll want more than carefully vague reassurances before slapping down $60-$100 at the local game store. 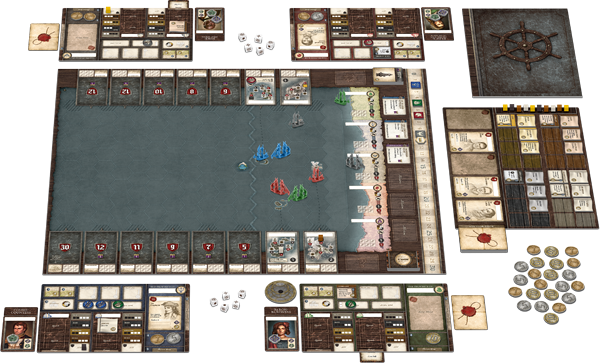 SeaFall, from Legacy concept creator Rob Daviau, has the dubious honor of being the first Legacy game that was a critical dud. 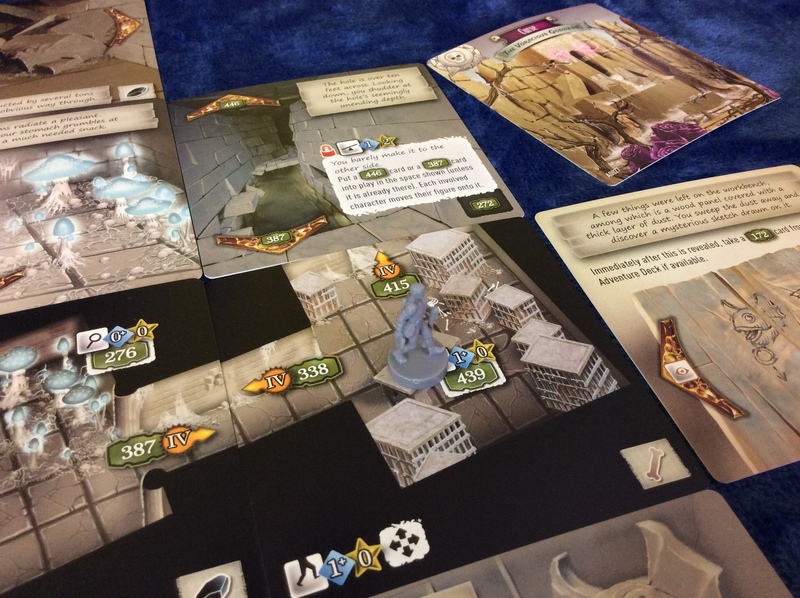 Meanwhile, games like T.I.M.E Stories and Sherlock Holmes: Consulting Detective, featuring strong narrative and puzzle elements, create another kind of spoiler minefield. Here, at least, the reaction is more justified—a puzzle can be solved only once, and knowing the solution ahead of time actually does spoil the pleasure of deduction. 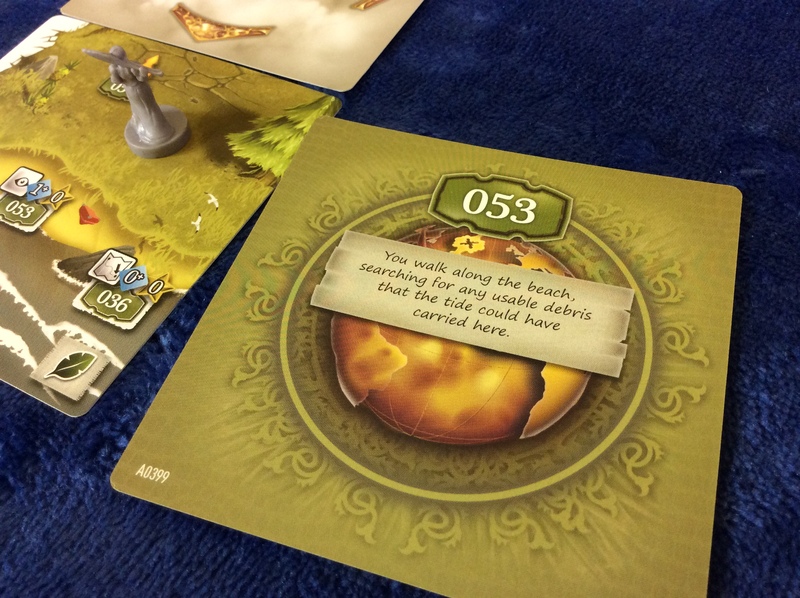 Also, there’s no ambiguity as to what constitutes a spoiler in the context of puzzles, riddles, and mysteries, whereas the players of Legacy games seem to have whipped themselves up into a froth of spoiler mania in which the smallest, most inconsequential detail is tantamount to a major revelation. Next, Mary turns her attention to the dock itself. Balancing carefully, she crosses to see if there is anything worth seeing. She nearly doesn’t make it, but her camouflage allows her to cross without alerting whatever is buzzing beneath the boards. There’s a rope tied to the end of the dock. 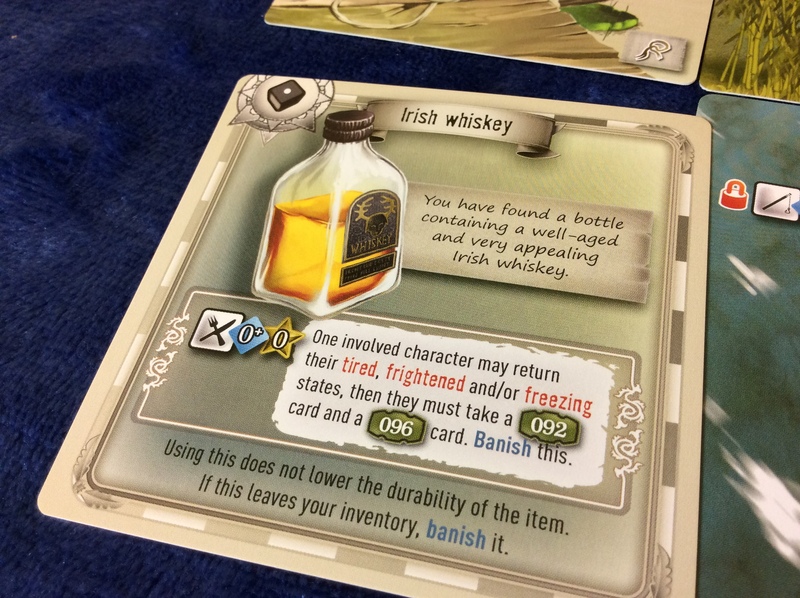 …and is surprised to drag from the water a bottle of well-aged Irish whiskey, which she holds onto for a rainy day. An equally important source of inspiration for The 7th Continent is the gamebook, a close relative of the Choose Your Own Adventure book, often incorporating RPG-inspired mechanics like dice-based combat, inventories, stats, and hit points. Just as point-and-click graphical adventures followed from interactive fiction, or text adventures, The 7th Continent is essentially a translation of gamebook mechanics into a primarily visual medium. 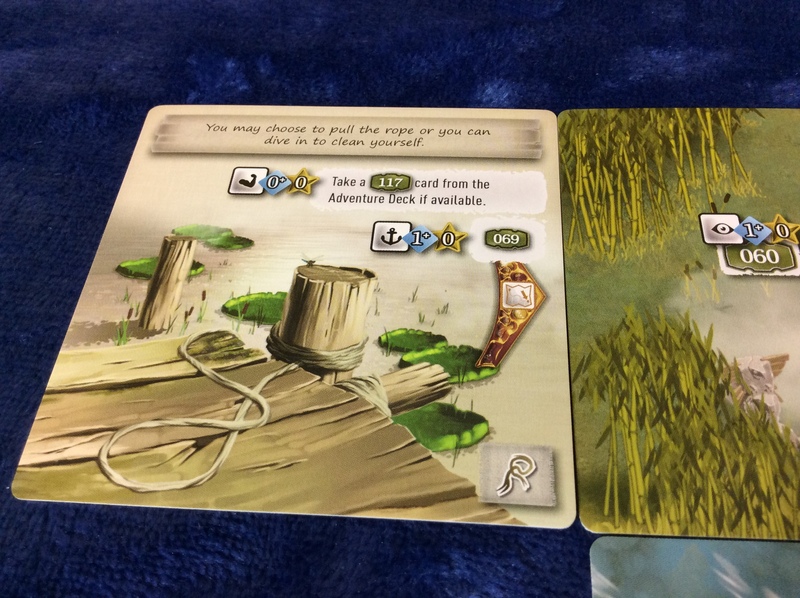 Each adventure card has a number, but some numbers have multiple cards…. 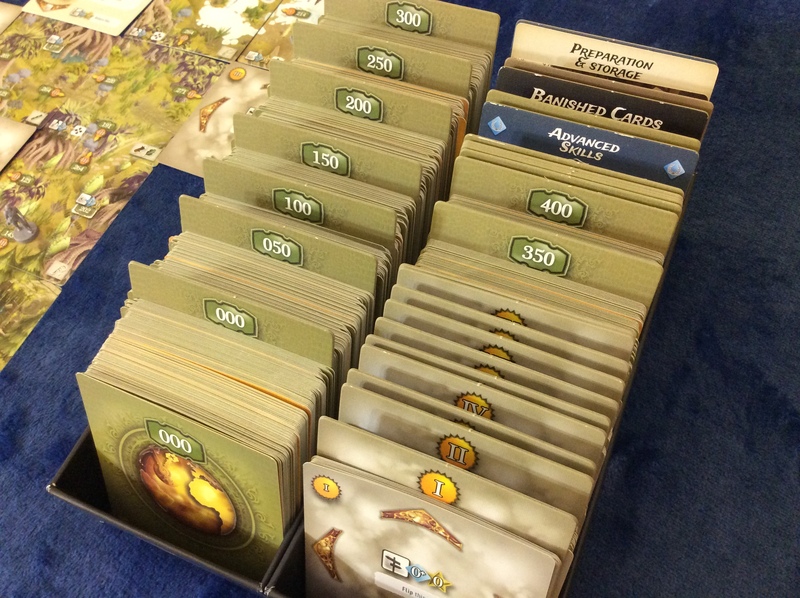 A deck of roughly 1,000 numbered adventure cards functions exactly like entries in a gamebook. As you take actions in the game—the player aid lists twenty-nine action types, including examining points of interest, accomplishing feats of strength or balance, going hunting, or scouting adjacent areas—you’ll frequently be directed to draw a specific adventure card. The back of the card will often have a brief, one-sentence textual description of what you see or what happens as a result of your actions. 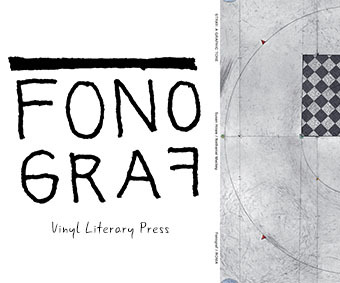 Flip it over, and you’ll get a gorgeously illustrated depiction of same, along with—well, it varies. Many adventure cards are new terrain, attached to the edges of your current terrain to form an ever-expanding map of the continent. Others are permanent events, attached to the terrain as a sort of inset giving you new interaction options. 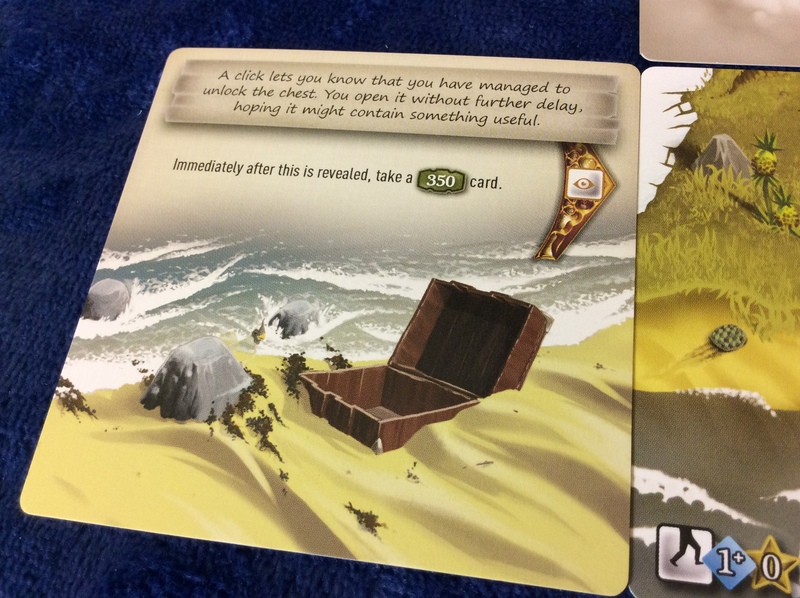 Some cards might be clues you’ll stash beneath your “satchel and journal” card for later reference, items you can add to your inventory, or temporary events that are resolved immediately and then discarded. Every card has the potential to introduce new actions, but that doesn’t mean they’re all good ideas. 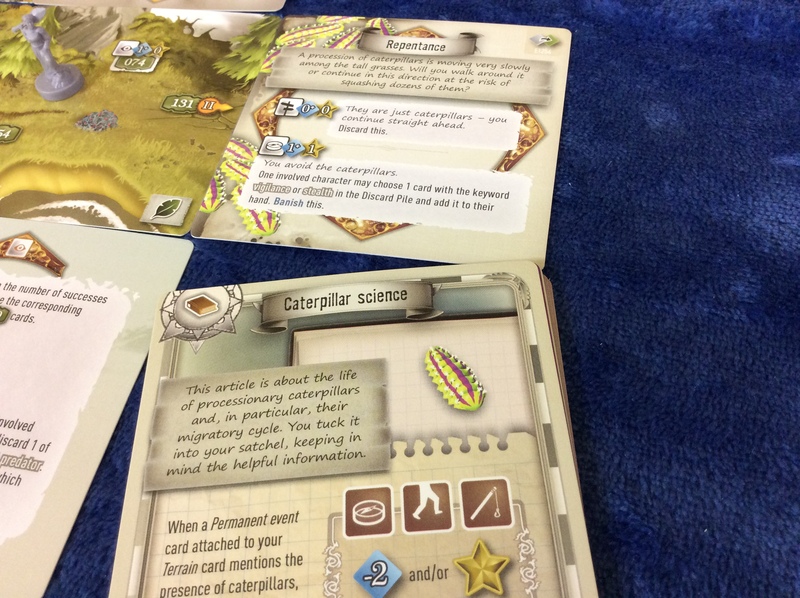 In general, you can take any action printed on an item in your inventory, journal, or hand; or on your current terrain card and any attached events. That’s a lot of options, much more than you’ll find most gamebooks. But actions aren’t free, and they aren’t always successful. It wouldn’t be a gamebook without skill tests, and the way The 7th Continent handles these is particularly ingenious. 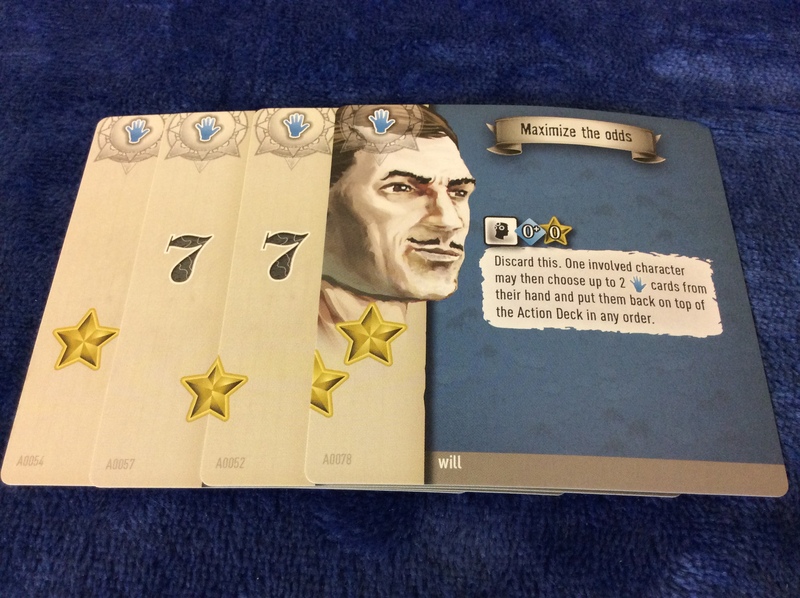 All actions are resolved by drawing skill cards—the action itself will tell you how many to draw and how many successes, in the form of stars printed on the card’s left margin, are required for the action to succeed. Some cards have one star, some have two or three, and some have only partial stars that must be paired with a half-star on another drawn card to count. If you get enough stars, something good (usually) happens; if you don’t, something bad might happen instead, or you might merely have wasted an action. 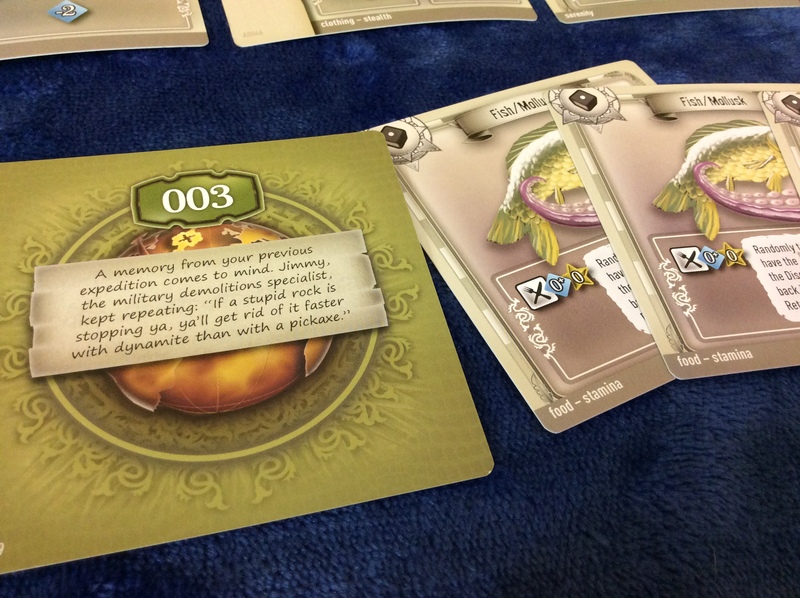 In this skill test, the player drew four cards and earned three successes—five or more if they used any items to convert 7’s. The half-star is worth nothing without its pair. 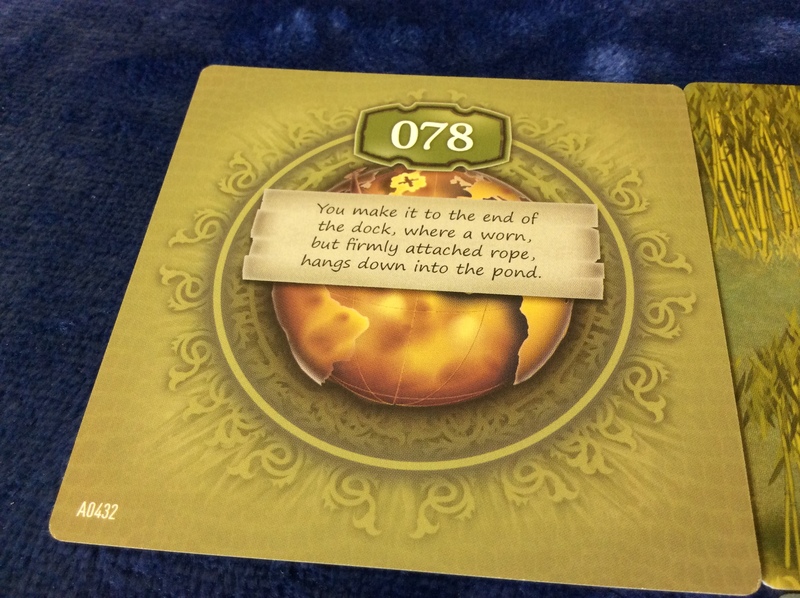 But there’s a push-your-luck element to it: most actions feature the “+” symbol, indicating that the printed number is only a minimum; you can draw as many cards as you’d like, though you have to settle on a number before you reveal any of them. You can also use items in your inventory to reduce the minimum, get free stars, or turn the “7” results into stars (jackpot! ); these will often be necessary to succeed at the trickier actions without exhausting your skill deck. Regardless of the outcome, you can add exactly one of the skill cards to your hand for later use. Unfortunately, the explorer’s curse caught up with him as he attempted to cross the chasm. While drawing loads of cards lets you accomplish tremendous feats of strength, you’ll want to be particularly frugal with your skill deck because it doubles as your party’s collective life force. 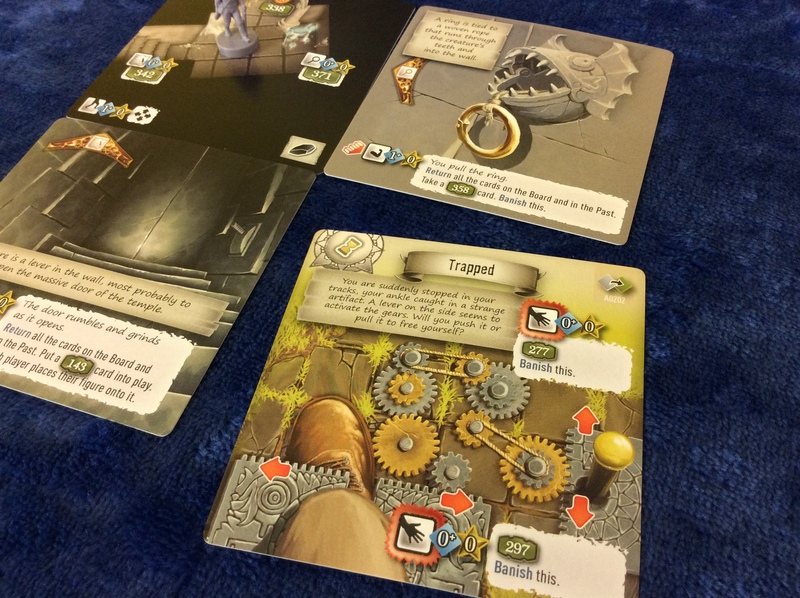 Underpinning the graphical adventure and gamebook elements of The 7th Continent is a survival game, a mechanical foundation that imbues the experience with tension and replayability. 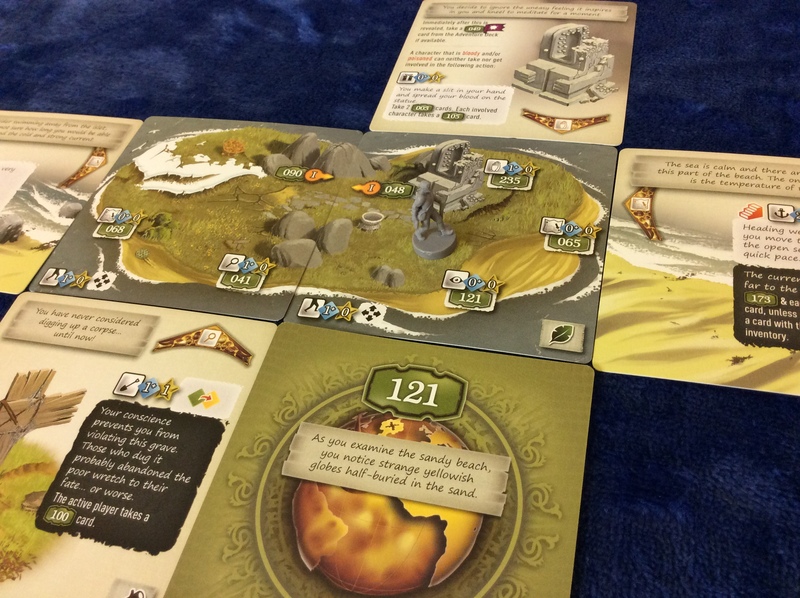 Think Minecraft, Don’t Starve, or, if you’re a board gamer, think Robinson Crusoe. 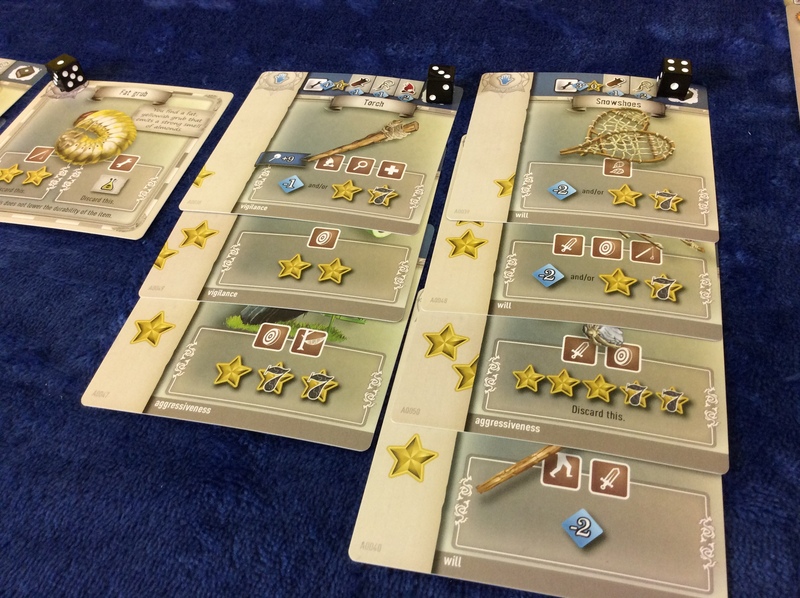 Every action taken moves cards from the skill deck to the discard pile as malaise, injury, and starvation chip away at the explorers. When the draw deck is empty, you’ll start drawing at random from the discard pile. 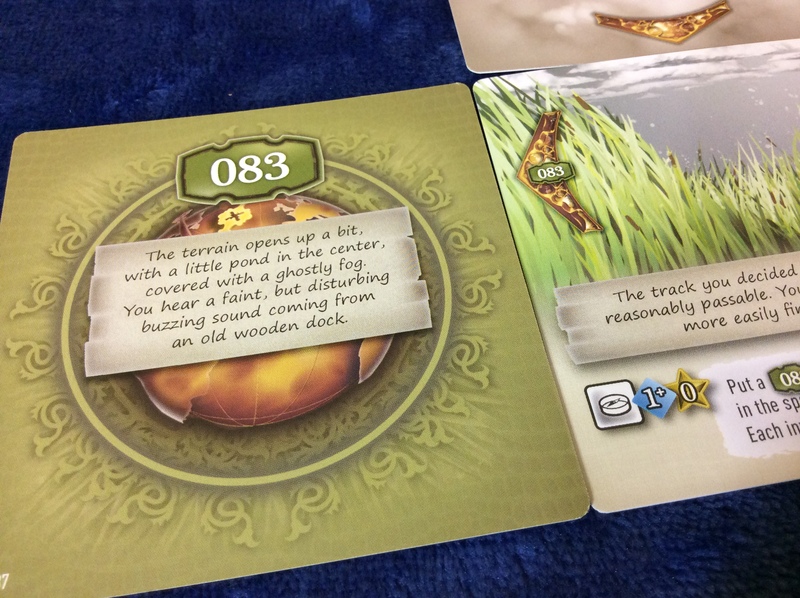 If you draw one of the five curse cards that were shuffled into the deck during setup, you’ve succumbed to the curse and your adventure is at an end. Meat is a critical resource in the game, and it’s always in short supply. You won’t get far on a single run through the skill deck, so you’ll need to look for every opportunity to replenish your lost stamina. But how can this be accomplished? This is one of the game’s little secrets, but it’s primarily done through hunting and fishing. 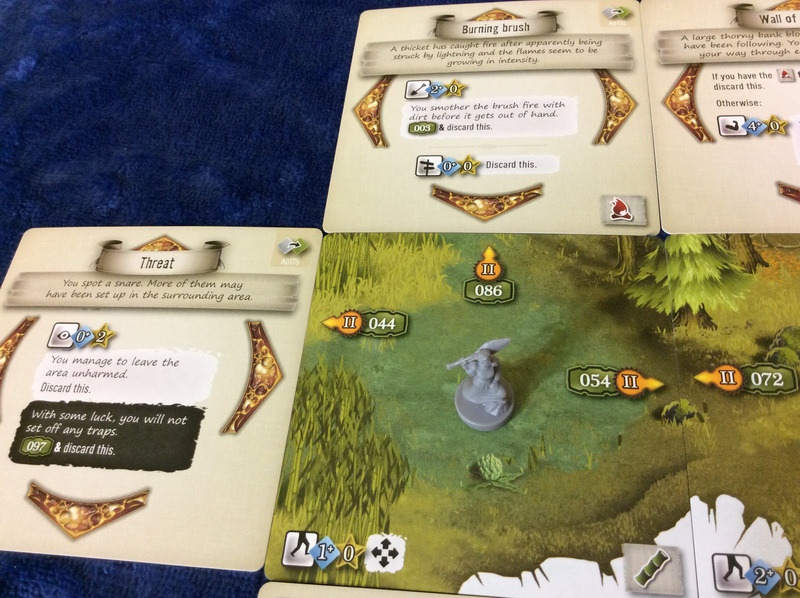 If you happen upon a terrain tile that allows you to perform one of these actions, you’ll be invited to draw a number of cards based on your number of successes from a specific part of the adventure deck, choosing one as the result of your hunt. Finding delicious game or succulent fish will fill up your inventory with nutritious meat, but you might also come up empty-handed or run into one of the continent’s exotic predators, from venomous snakes to the towering horned bear. There is a wide variety of negative states to afflict your party of explorers. 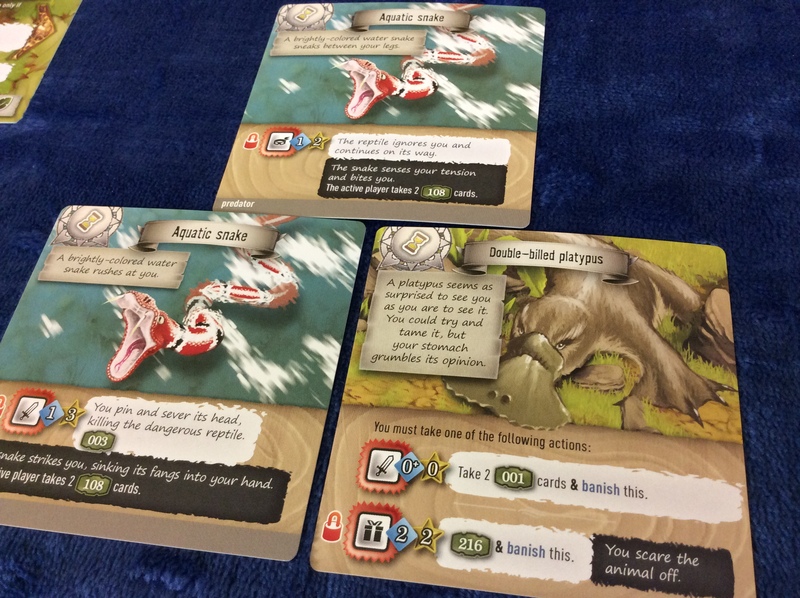 Encounters with predators, failed or misguided actions, and more might force you to draw one of the game’s negative state cards, which range from injury and nausea to poison and madness. 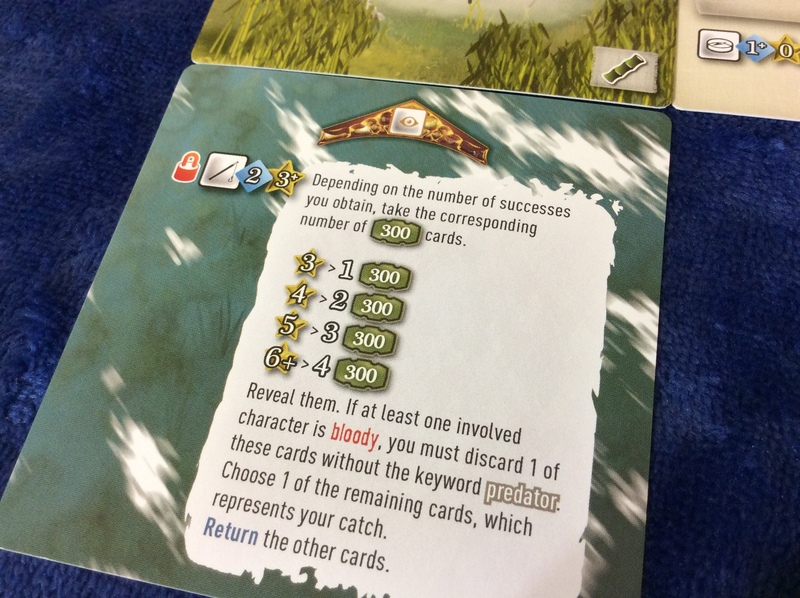 These states often have no effect on their own, but you’ll want to get rid of them as soon as possible; every once in a while, when you draw a new state card, it will contain the dreaded “loss of vital force” icon, which forces you to discard a card from the top of the skill deck for every other state card you have. 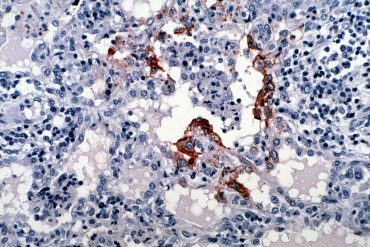 Of course, some states are cured more easily than others; getting rid of tiredness merely requires succeeding at a simple action, while other states, like poison, can’t be cured…at least, not by obvious means. 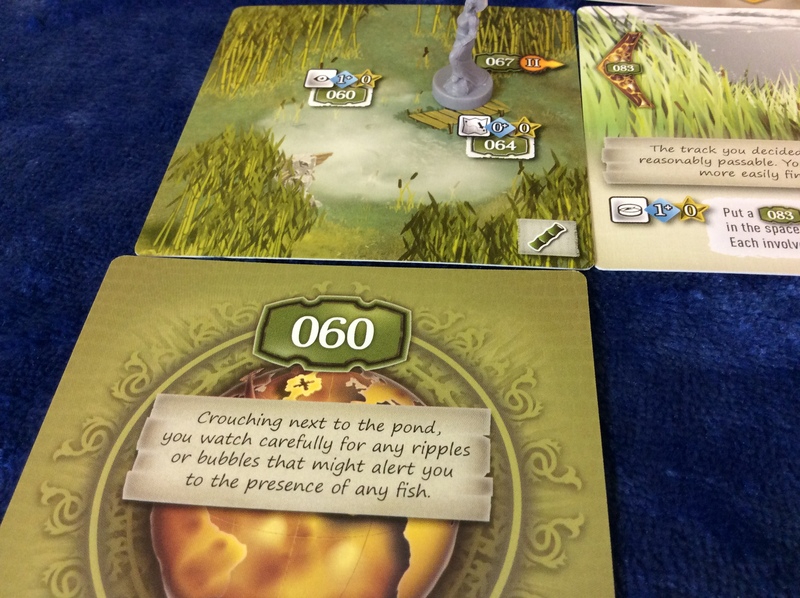 Before returning to the swamp, Mary makes another fishing attempt. 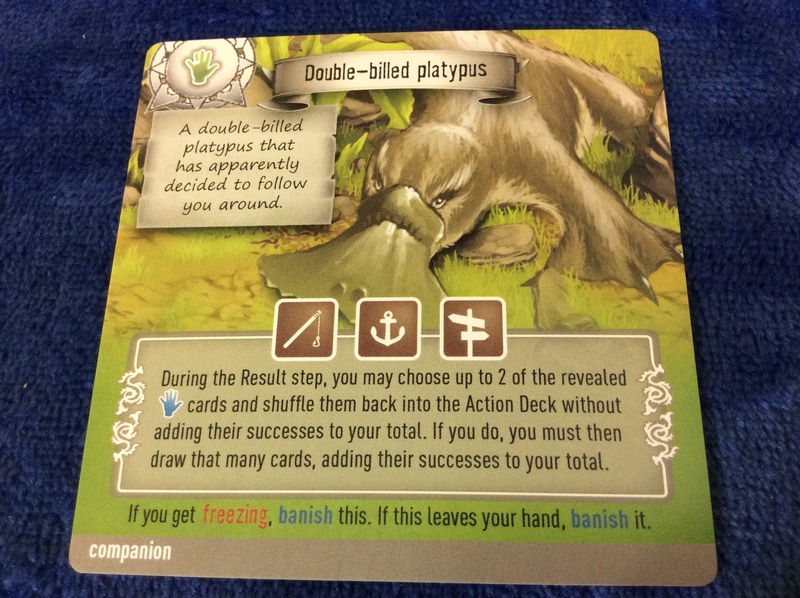 She is surprised to encounter a double-billed platypus, one of the continent’s bizarre native creatures, swimming near the surface. Her first instinct is to hunt it for its meat—which would be easy enough, as the beast appears quite docile—but an odd thought takes hold: this thing seems curious, even friendly. With a small offering of food, Mary is able to pique the creature’s interest, and it begins to follow her. Her new animal companion might offer unexpected benefits as she continues her journey north. I’ve run afoul of the spoiler police more than once. When I released my playthrough videos of the first few scenarios of Pandemic Legacy on YouTube, I received comments complaining that the preview images showed the game’s board—a map of the world, nearly identical to the one in vanilla Pandemic. 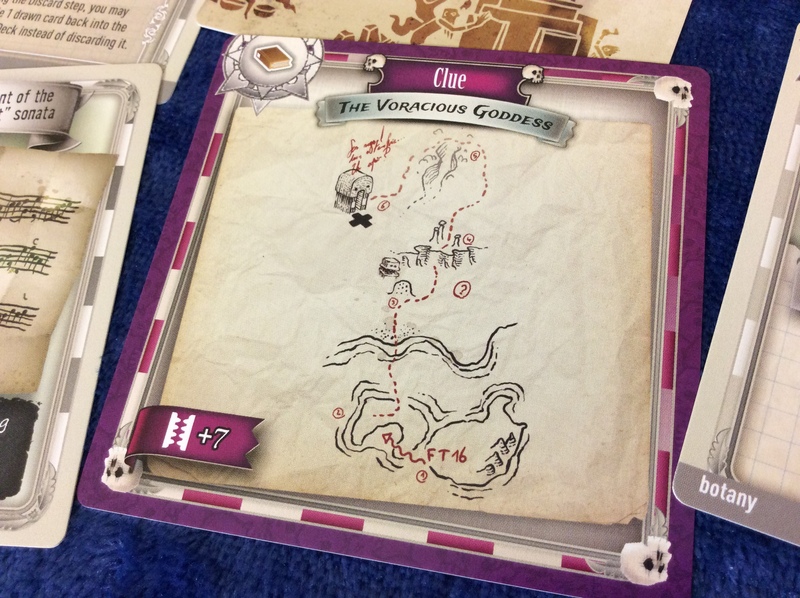 I got into trouble in the Gloomhaven forums when, asking for clarification on a scenario, I referred to it by name—“Vibrant Grotto”—rather than scenario number (7). 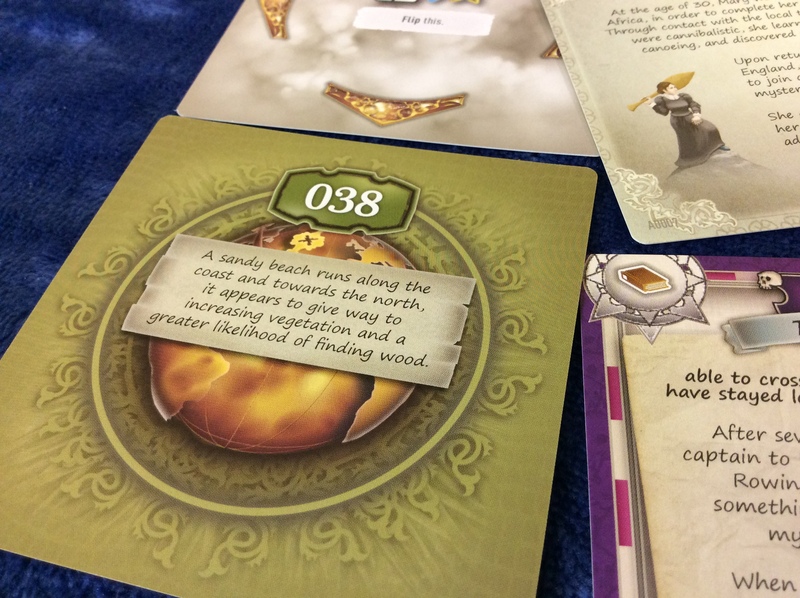 When I linked to my Entropy review of Gloomhaven on BoardGameGeek, I was informed that I had broken the Spoiler Code by describing, in the body of the review, elements of the personal quests my party had experienced and a few early moments in the campaign narrative. Spoiler sensitivity is a form of censorship, and I generally have no patience for it. What begins as a polite consideration rapidly turns toxic when people give too much power to their own discomfort, feeding the beast of hypersensitivity. 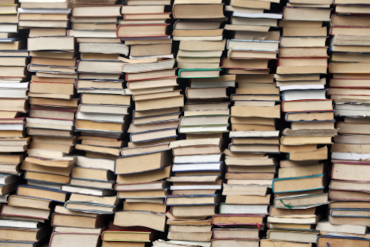 There’s a ready comparison in the hotly debated topic of trigger warnings: the warning itself is good, but the hypersensitivity that demands it is a psychological harm and shouldn’t be confused with a moral stance. I’ve taken a hard line of my own on spoilers, and that’s that excessive pussyfooting around spoilers is anathema to good reviewing. 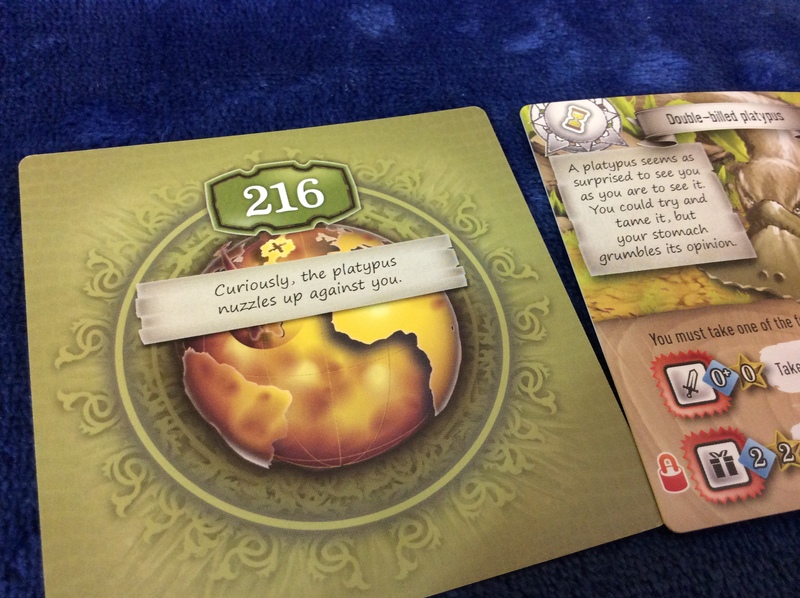 So, with my compliments, enjoy this spoiler-filled review of The 7th Continent. Try not to exhume any corpses, unless you’re Victor Frankenstein. Now, Mary has only to cook up her meat. Raw meat will do in a pinch, but cooked meat is more nutritious and filling. If she builds a campfire near the wall of thorns, Mary might even be able to kill two birds with one stone…. And what is that to the east? 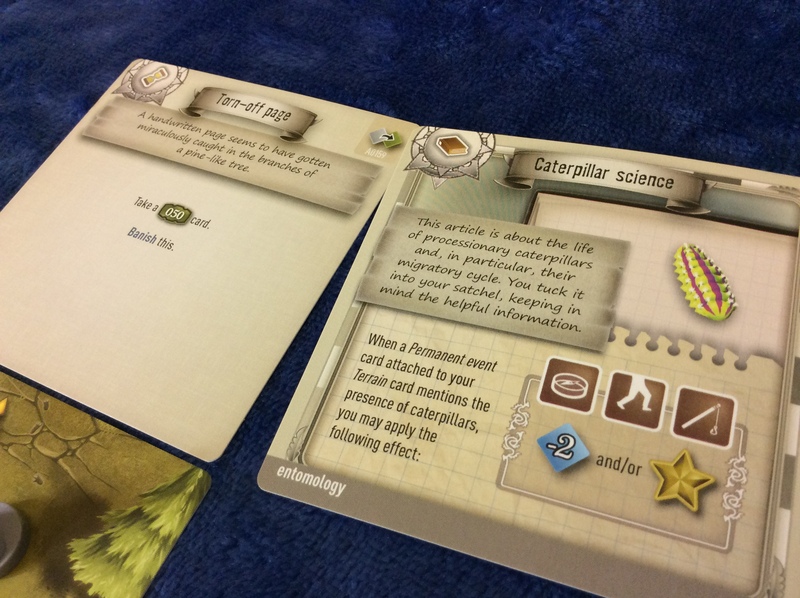 A procession of…caterpillars? Hunting and stamina are some of the linchpins of the survival genre, but equally important is item crafting. Many of the skill cards found in the deck—remember, you can draw one of these into your hand whenever you attempt an action—represent ideas for survival equipment you might craft from the raw materials on the continent. These items, as previously mentioned, often allow you to accomplish actions more efficiently, though some actually make new actions available—various fire-starting tools, for example, provide access to the action that creates fire. 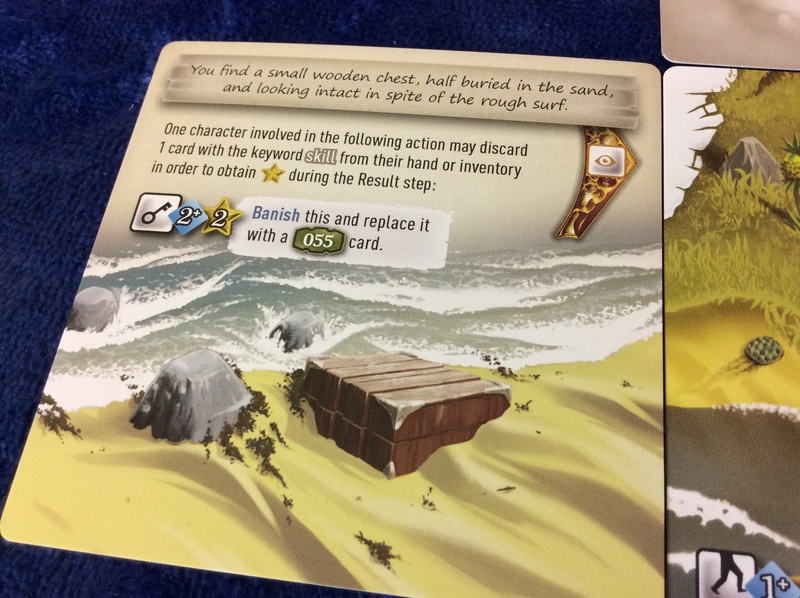 You can build any of these items regardless of your location on the island, but if the correct raw materials are present on your terrain card (or an attached event, or a plant you have botanical knowledge of, et cetera), you get a discount on the crafting action. 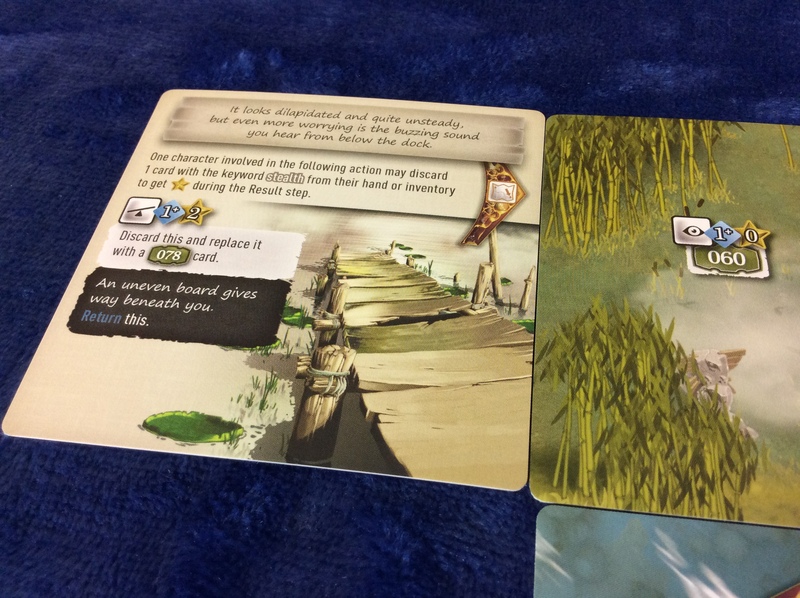 Of course, you need to weigh the skill cards you’re saving from having materials available against the cards you’ll end up discarding as you trek around the map, though items like walking sticks and snowshoes can help with that. The really unique thing about The 7th Continent’s item crafting system is how it handles inventory management. 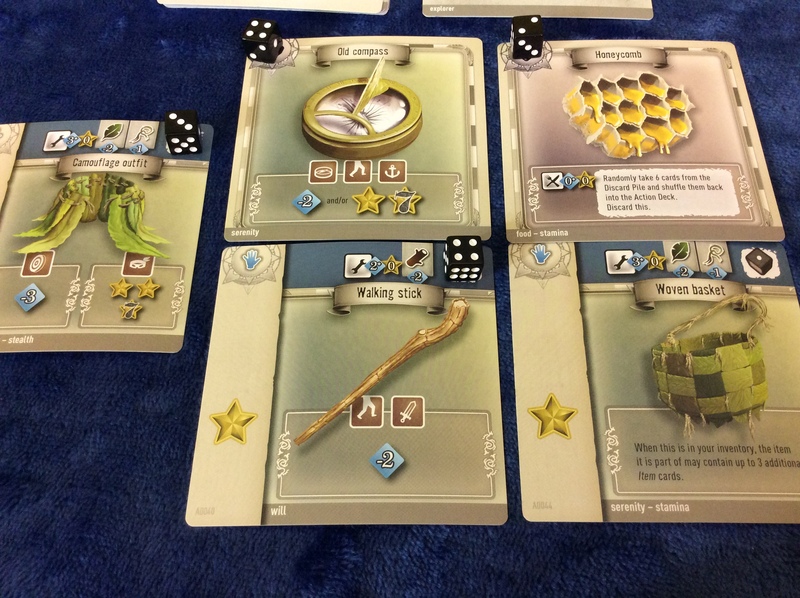 Each explorer can only hold a few items at a time, depending on player count, and each item has limited uses, tracked using a miniature six-sided die. However, when constructing a new item, you can combine it with one of your existing inventory items to create a kind of superequipment: a single use of the combined item gives you access to the abilities on all cards it contains. Even better, if the new item matches at least one keyword with the top card in that inventory slot (what you might consider the ur-item), you get to add its d6 value to the item’s total durability. Does it make sense that you’re lashing together a snare, bandages, a raft, and a shovel to create the ultimate survival gear? Not at all, but it’s a mechanically compelling system nonetheless. Individual pieces of equipment can be combined into mega-items, though it doesn’t always make sense. To recap: We have a game that fuses the logical and spatial puzzles and hidden details of a graphical adventure; the choice structure and skill tests of a gamebook; and the survivalism and item crafting of a survival game; bolstered by unique, push-your-luck-inspired action resolution and compelling hand and inventory management systems that set it apart even within those genres—not to mention the vivid and whimsical art, the countless little secrets, and the supremely functional card storage and save systems. In a year that gave us Gloomhaven—possibly the best fantasy adventure game ever made—having another cooperative game of this level of ambition and execution isn’t a curse; it’s a Christmas miracle. And when you think of the little square cards, so reminiscent of screen transitions; the weird lifeforms and puzzle-filled ruins; and the magical melodies waiting to be discovered, this is an exploration game of which Shigeru Miyamoto would be proud. This is but a small section of the continent available to explore.